This is turning out to be a real comfort-food week. It must be the cold weather — I’m nesting. 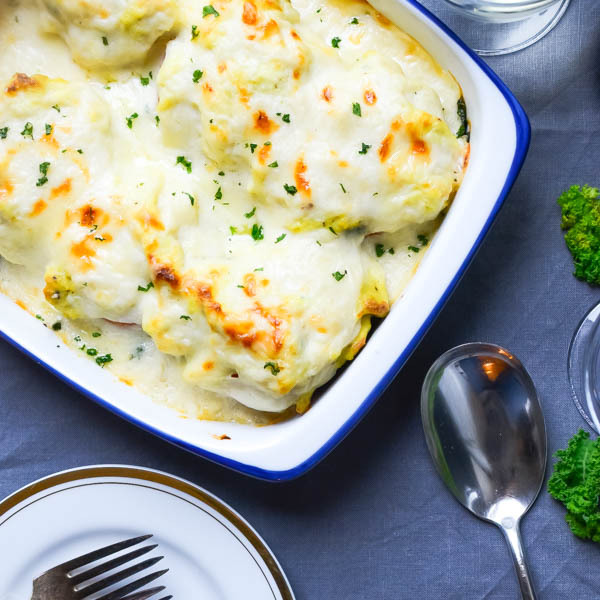 And for me there’s nothing that screams comfort food more than this heavenly rich, cheesy tomato egg gratin courtesy of my grandmother, Madou. She would fix this luscious egg bake as a first course for family dinners and it was always one of my favorites. I don’t make it very often, but when I do, I generally serve it alongside a roast chicken or other protein, though, it would make a very satisfying Meatless Monday main course. The cheese infused bechamel takes ordinary ingredients like tomatoes and eggs and elevates them into something really special. My spin on this dish is the sauteed kale. Madou never added it, but it really works well in this combination. The key to this gratin is the eggs. They can’t be overcooked. They should be soft and a little wet. You can achieve this by cooking them on a very low (and I mean excruciatingly low) heat and stirring constantly. It took me 12 minutes to scramble these eggs. Layer the casserole starting with a smear of bechamel on the bottom of the dish, then the sauteed kale and tomatoes. 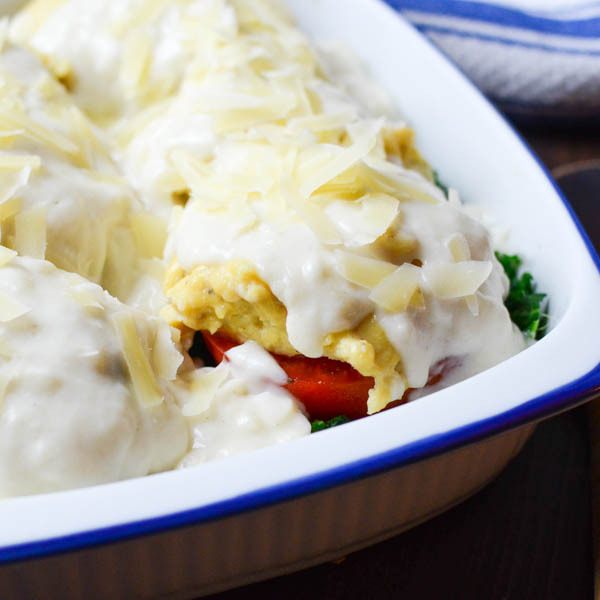 Mound a spoonful of the egg on top of each tomato half and smother the whole thing in that savory cheese sauce. A few sprinkles of extra grated cheese will ensure a gooey, golden finish. This is a riff on a dish my grandmother has made all my life. 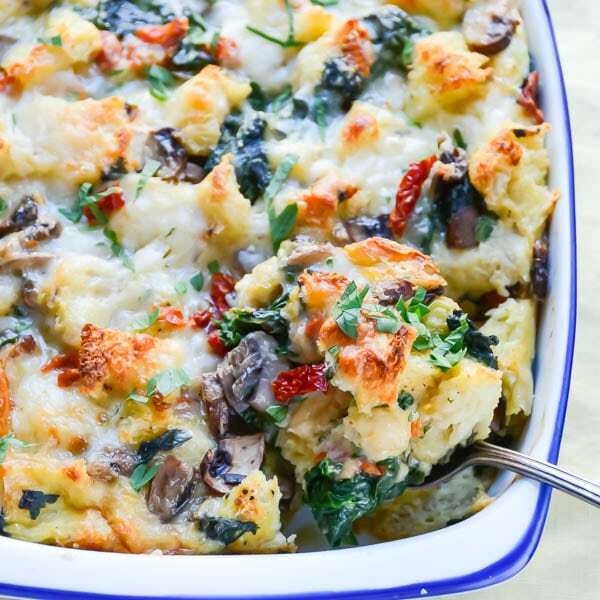 She'd serve it as an appetizer for a large group, but I think it makes a great vegetarian meal, or a delightfully different brunch casserole! Spray a small casserole dish with vegetable spray and set aside. In a small saucepan, melt two tablespoons of butter over medium high heat. Sprinkle the flour, 1/4 teaspoon kosher salt and the white pepper into the melted butter and whisk until well combined and bubbly. 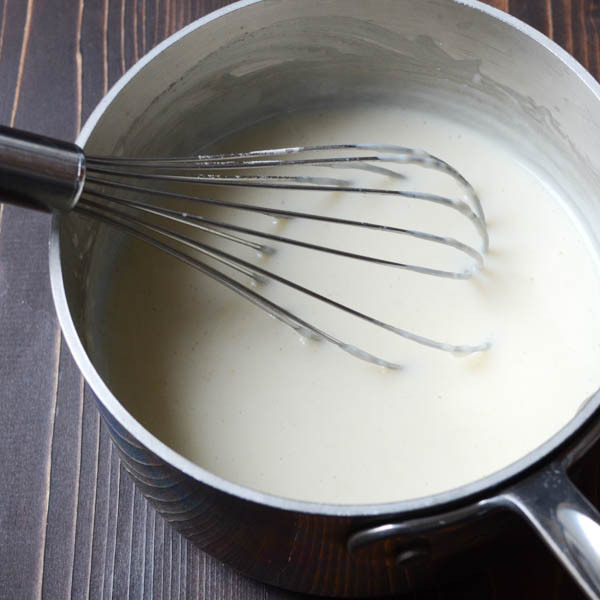 Gradually add the milk stirring constantly and scraping the sides. Heat until the mixture begins to bubble and cook for one minute, stirring constantly until it thickens. 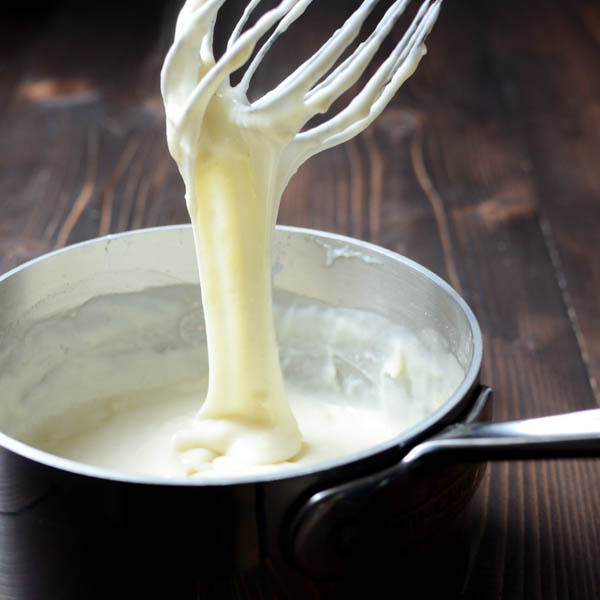 Remove from heat stir in 1 cup of the cheese until its melty and gooey. Spoon 2-3 tablespoons of the cheese sauce into the bottom of the casserole dish. Set aside. In a medium pan with a lid, add the water to the pan and heat over medium high heat until water almost boils. 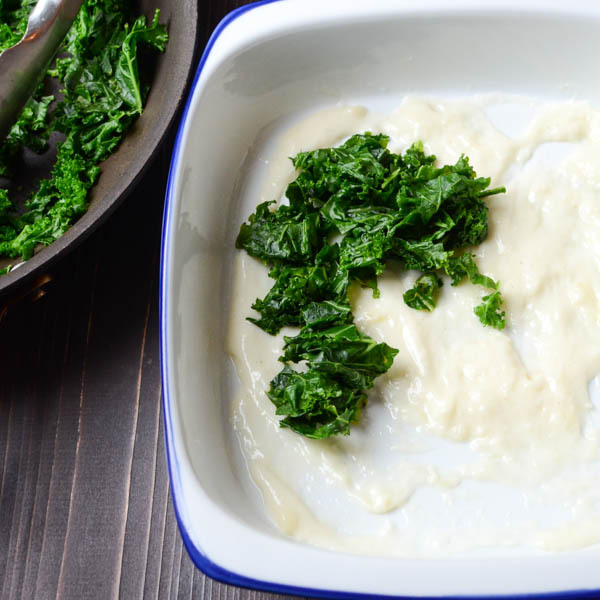 Stir in the kale, sprinkle with 1/4 teaspoon salt, cover with lid and reduce heat to medium-medium low, cooking just until the kale wilts and water has mostly evaporated -- about 2-3 minutes. Transfer the kale to the casserole dish, spreading it evenly over the bottom. Remove the watery seeds from the tomatoes and arrange cut side up in the casserole dish. Sprinkle with 1/4 teaspoon salt. 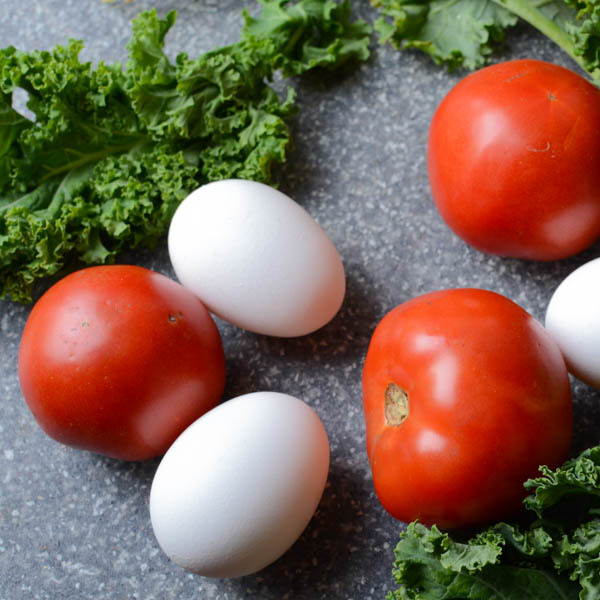 Whisk the eggs and 1/4 teaspoon salt in a small bowl. 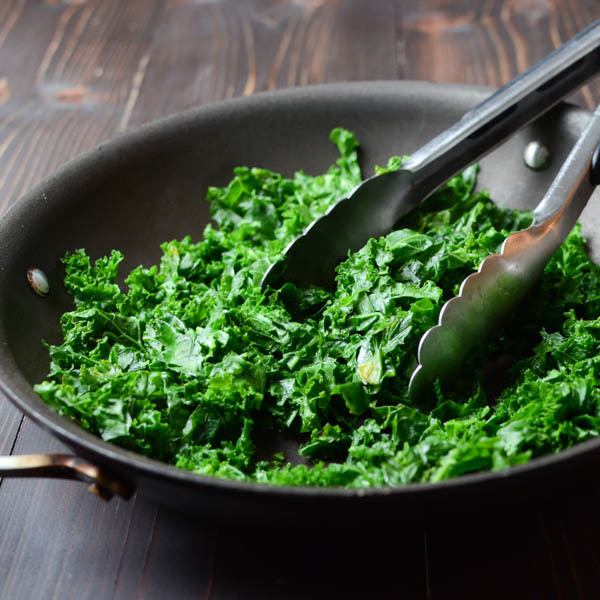 Melt 2 tablespoons butter over medium low heat in the pan that you cooked the kale in and add the eggs. 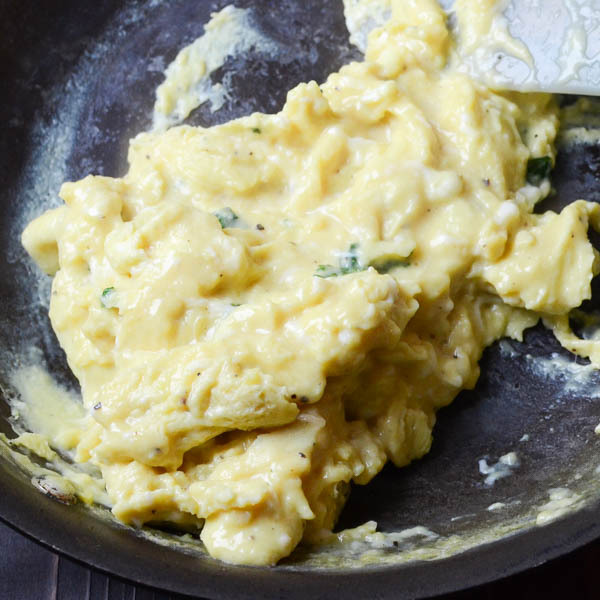 Continue to whisk the eggs until you have a very soft scramble, stirring constantly. (Eggs should be very soft and a little wet). 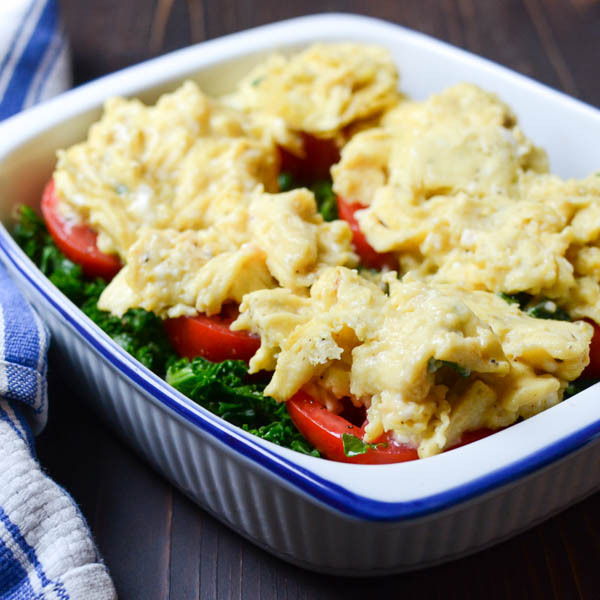 Evenly divide the scrambled eggs over the tomatoes. Spoon the cheese sauce over the gratin (note: sauce will be very thick) and sprinkle with remaining cheese. Bake for 20 minutes, then turn the broiler onto high and cook for 3-4 minutes more until the top begins to brown. Let the gratin rest for 5 minutes before serving. This looks heavenly!! 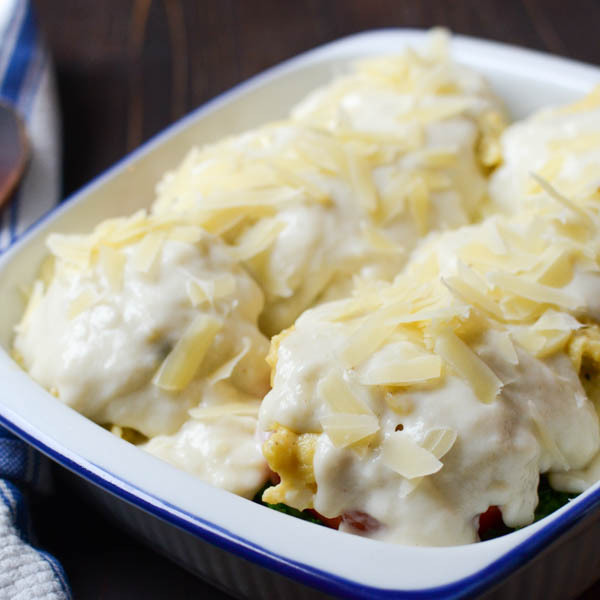 Pure comfort on a plate; I bet those eggs are just perfect even if they do take ages to cook! 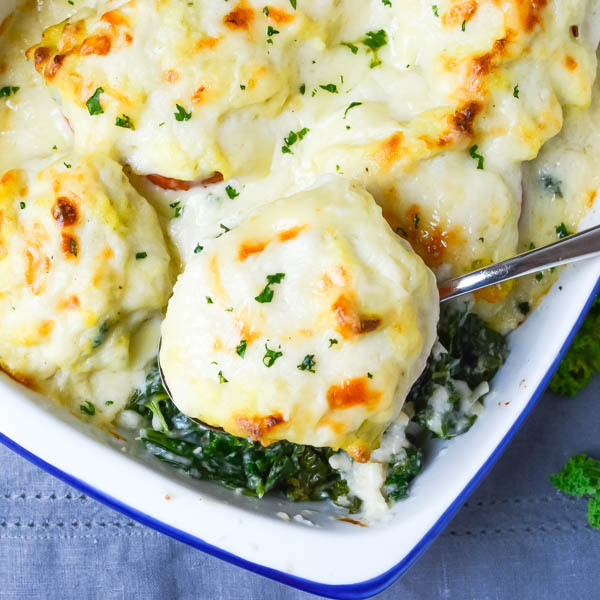 The egg, the béchamel and all the other flavours make this a definite winner! I’m glad you like it, Annie! She was a whiz in the kitchen Sarah! I’ve never seen anything like this!! 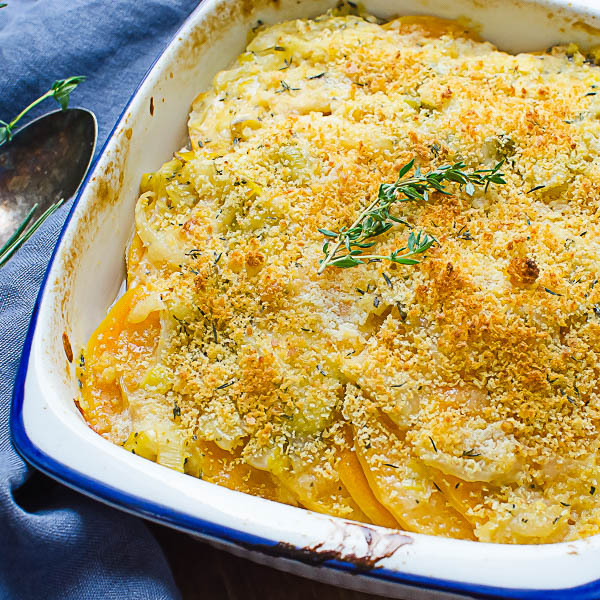 I love gratin and I love your take on it! I can’t wait to try it. My hubby is going to be so happy when I serve him this!! 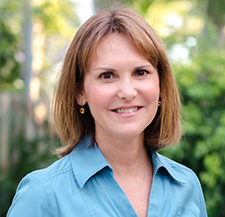 I think it must be a “French” thing — because my grandmother was French and most of the things she prepared were French dishes. 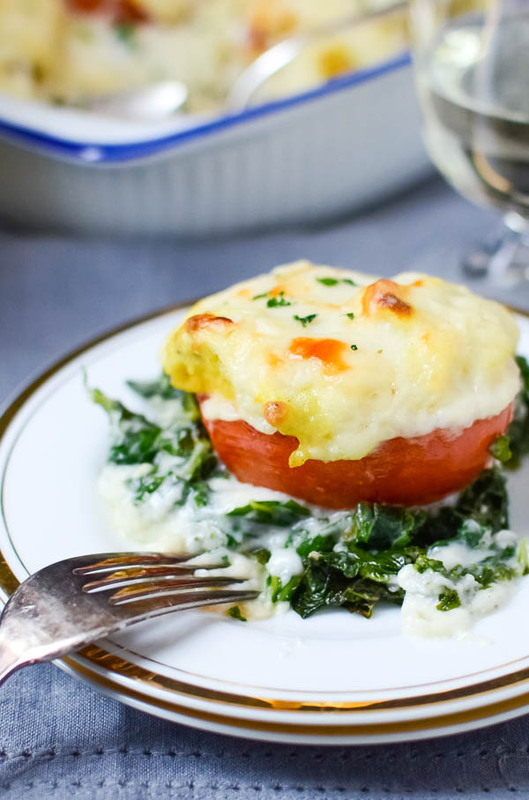 I’m a sucker for gratin recipes! This looks delicious. Perfect addition to Thanksgiving menu. 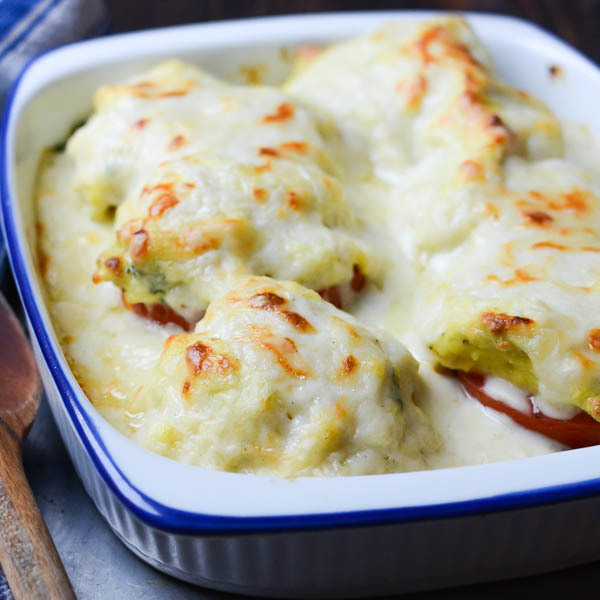 This definitely looks like the perfect comfort food! Well that looks amazing. Love the layers! Eggs are hard sometimes…. but your explanations take the difficulty right out of it. Pinning this to make soon! 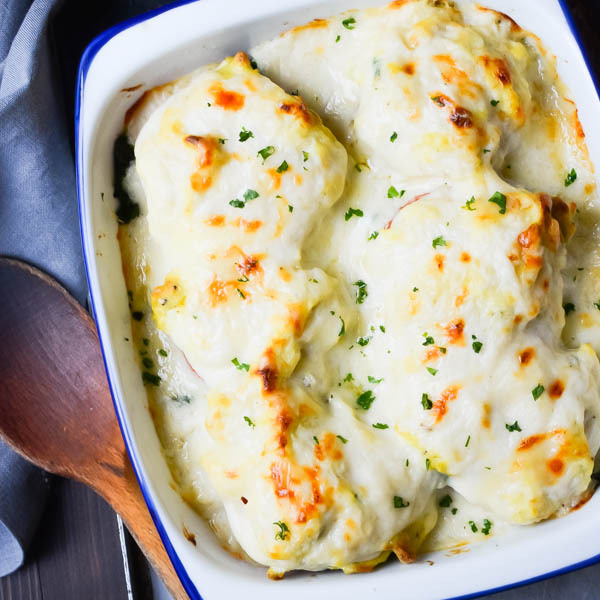 Yum, I have never tried egg gratin but this looks delicious!!! I will have to give this recipe a try. Thanks for sharing! There’s a lot of things going on in this dish! Now that is real comfort food for sure. I’m not a very cheesy person…. but this looks out of this world! I actually want it! I agree! I’m glad you like the photo! What a gorgeous brunch! I also cook my eggs excruciatingly low – they turn out so well when you cook them like that. I am going to make this next time I have house guests, but maybe with spinach instead of kale. I’m sure that would be wonderful! Stunning! Simply stunning! I need this recipe in my life! Wow, thanks Elizabeth! I appreciate it. It’s so good! Words can’t describe how delicious this looks to me right now!! 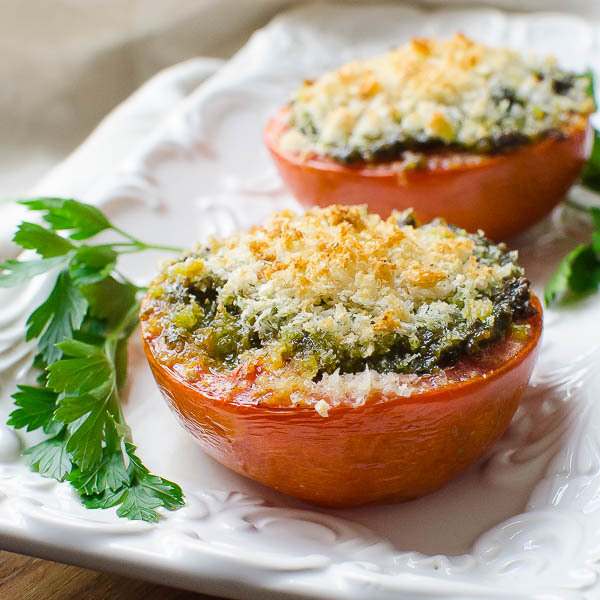 Yum – what a great recipe, can’t wait to try! Thanks, Betty – wish I could take credit, but this one is my grandmother’s (minus the kale).